Click the Sharing command on the Options menu. Right-click the task tray icon and select the Sharing command from the Options submenu. Click the Sharing tab in the Options window after it has been displayed by using one of the other commands in the Options menu. Use the "Add Shared Calendar From Local Network" command on the File menu, without having previously specified the shared server. Use the "Share to Local Network" command on the Share menu, without having previously specified the shared server. The Sharing tab of the Options Window enables you to control how appearances and event completion statuses are shared over your local network. If you don't intend to share calendars over a local network, these options can be ignored. When the tab is activated, there might a short delay while VueMinder searches your network for calendar servers. Instructions for configuring calendar sharing can be found here. If the window says a server can't be found, see the troubleshooting tips at the bottom of the setup guide. In most cases, this is due to a firewall on the server blocking communication with other computers on the network. When this option is checked, the appearances specified for calendars and events, as defined in the Calendar Properties window and Event Editor, will be shared. This option can ensure that shared events look the same on all computers. When unchecked, event and calendar appearances will be local - not shared. This option is similar to the option to share calendar and event appearances, but for category, location, and priority types. The appearances for these data types are specified on the Category Editor, Location Editor, and Priority Editor windows, respectively, and will be used when the Categories, Locations, or Priorities tabs in the Calendar Items List are active, or when the "Color Events Using" option in the View menu is set to show category, location, or priority colors. Sharing these appearances will help ensure consistent event appearances on all computers. When unchecked, any changes made to these appearance settings will be applied to the local computer only. When this option is checked, an event marked as completed will also appear as completed on all other computers sharing the same event. Note, enabling this option could result in reminders not appearing on all computers if the "Don't show reminders for completed items" Reminder Option is enabled. When the option to share event completion status is disabled, each user will have control over when (or if) the event is marked as completed on their local computer, without affecting the event completion status for users on other computers. When this option is checked, contact data will be shared and synced over the local network. This feature is not available in the Pro version. The computer name you installed VueMinder Server on should be listed in the dropdown menu. If you see multiple computers listed, make sure your computers are using the correct server name. Otherwise, some calendars won't be visible to some computers. 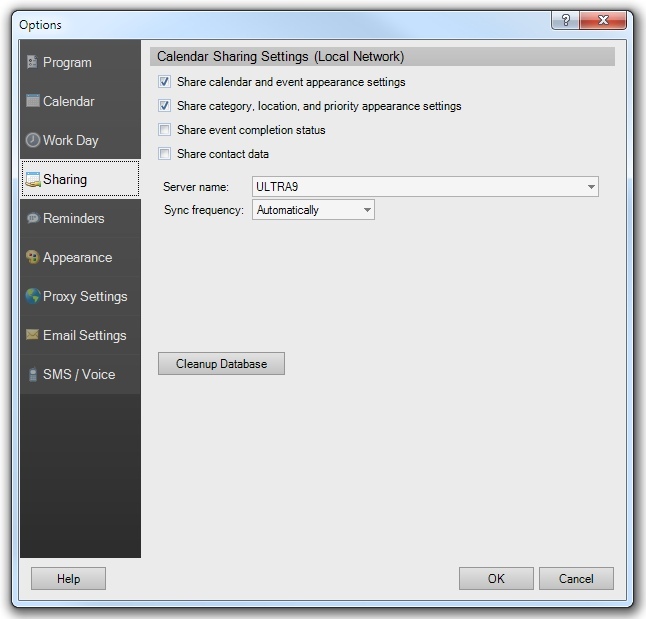 Calendar sharing is only enabled when a server name is specified. To disable calendar sharing, clear the server name text using the Delete or Backspace keys. The recommended sync frequency is "Automatically". When this frequency is used, VueMinder will monitor the server for any changes and automatically sync when needed. Syncing will occur within 20 seconds of any changes. If you have a large number of shared events, many people sharing calendars and making changes at the same time, a slow server, or a slow connection to the server, you might notice reduced performance. If that's the case, a different sync frequency can be selected from the drop-down list. Instead of the server being continuously monitored for changes, VueMinder will only check for updates at the specified frequency.